From the blog title you can infer that I choose option #3, try out WiMax. I’ve been reading about WiMax for years and knew that I could benefit from the fast data rates. 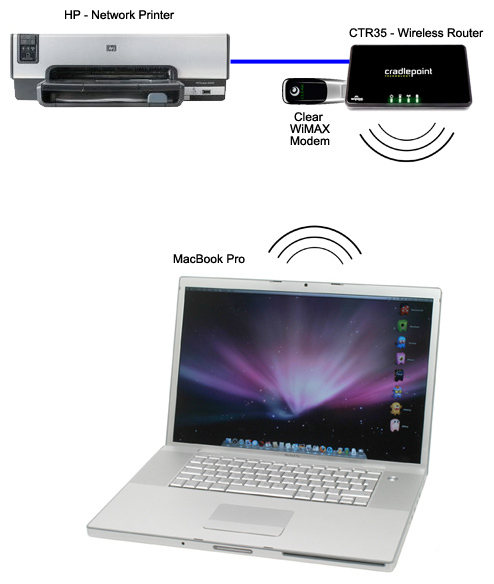 At first I just connected my Clear WiMAX modem directly into my MacBook Pro laptop however I didn’t like the looks of the modem sticking out the side of my laptop, instead I wanted to try WiFi. So now I have nothing plugged into my laptop and I can connect to the Internet with WiFi and print documents without any USB cable strung across the floor. I still need to follow up with Cradlepoint and ask about the bandwidth of their Wireless Router because I’m about 2X slower on downloads with the Wireless Router compared to WiMAX plugged directly into my laptop. Perhaps I will learn about some speed settings that can be tweaked.